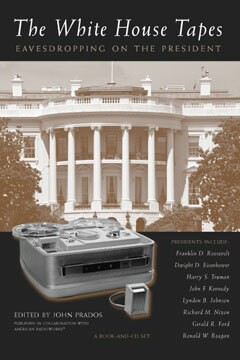 The White House Tapes: Eavesdropping on the President is a fascinating portrait of eight recent American presidents—including Roosevelt, Eisenhower, Truman, Kennedy, Johnson, Nixon, Ford, and Reagan—as they respond to some of the most critical events of the late twentieth century. Edited by historian John Prados, the book contains transcripts of the heat-of-the-moment Oval Office phone conversations and confidential meetings (often with participants who did not know they were being recorded) that changed the course of history. A comprehensive introductory essay on the history of presidential recordings and detailed introductions to the transcripts themselves put these key moments in American history in context. Never intended for public consumption, one exchange captured here constitutes the famous “smoking gun” tapes of the Watergate era. Another sequence has Lyndon Johnson finding out from J. Edgar Hoover about the murders of three civil rights workers in Mississippi just as he also learns from Robert McNamara about the breaking crisis in Vietnam’s Gulf of Tonkin. Take together, the selected conversations with top aides, political figures, and heads of state (including Walter White, Sam Rayburn, William Colby, Martin Luther King Jr., Billy Graham, H.R. Haldeman, Henry Kissinger, Yitzhak Rabin, and Anwar el-Sadat), reveal the true inner workings of the American presidency and offer us an unparalleled opportunity to be a fly on the wall at the meetings we were never supposed to hear. This book is published in conjunction with “White House Tapes: The President Calling,” a new radio documentary produced by Stephen Smith and Kate Ellis of American Radio Works®. A compact disc of the program accompanies this book in a set that also includes eight compact discs on the secret Oval Office recordings featured here.